Every once in a while, one is reminded of the choices we make in life, of how we sometimes get mired in the vacuum’s we create, and how my vacuum ain’t your vacuum and vice versa…and I guess we all have our own qualifications for what constitutes a good vacuum/life and what don’t, what is necessary for happiness and what isn’t. Unfortunately, we also will oftentimes use our personal positions to judge those around us for the choices they’ve made. Hell, I do it and will probably continue to do so to some degree, but I try to limit my judgements to those people whose actions I believe are harming others, be they a politician, a business person, a friend or stranger. I watched a movie last evening called Last Train Home about Chinese migrant workers, and what they have to do to get home for the Chinese New Years, and about one family in particular and what it did to the kids to have their parents gone 360 days a year for the purpose of working in the city to make money to raise the family. Pointed out by one train passenger is how China has very few brands of their own, and how essentially they are the manufacturer to the world’s companies. So, as the family in the film disintegrates, as the sweatshop conditions are shown, the tragedy and misery of absent parents and such consequences, and the horrific attempts to ride these trains are shown…I wondered about the American corporations that have a hand in this horror story, and I also wondered if they would have these sort of conditions present in this country if they could…some might say, of course they would and that’s pretty greedy ugly, and some might say of course not which would beg the question, why is it okay then to do that to Chinese families? And this made me think again of people who will look at the entire mess that unfettered Capitalism can create and choose to opt out, say enough is enough and just fade on out, create their own paths, live their own lives in whatever way makes sense to them, screw what anybody else says. Personally, I know I’ve made a number of choices and life decisions some people around me don’t understand. No worries, they don’t have to as it really isn’t for them to understand…and in the growing wealth disparity our politicians seem completely comfortable with, it would appear that more people will soon opt out to live their own lives – either by choice or lack of choice – by way of communal homes, off-grid, homeless travelers or just plain homeless…etc. 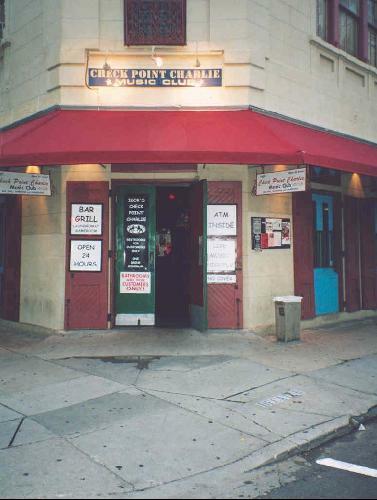 And this reminds me of a night awhile back where I was hanging out at Checkpoint Charlie’s on the Marigny side of the Esplanade and how this band of people some might call gutter punks asked to come onstage and play, and how they were allowed to do so…and just how good they were. Hell, I bought a CD. PS…the band is also shown in the book Sidewalk Saints about New Orleans street performers…good book, check it out….